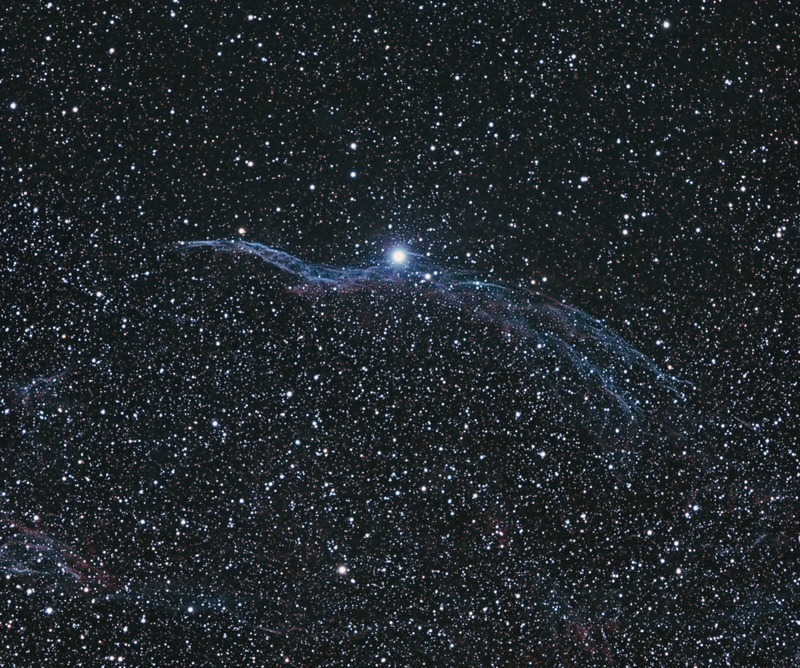 This is the Western part of the Veil Nebula (known as the Witch's Broom), a supernova remnant in the constellation of Cygnus. This image was taken on Sunday 10th November 2013). The seeing wasn't too great due to the jet stream, and I was battling the moon which was nearly half full and within 45 degrees of the target at a guess. This is an unmodified DSLR version, hence the relative lack of Red/Ha in the nebula. Filter: Hutech IDAS LPS P2 2"
Wow - Im new to all this - Im looking at buying some kit and Im very puzzled as to how such a small refractor can produce such beautiful pictures - was thinking of buying an 8" newt. Sean, you don't say what camera you plan to use, but assuming it is a DSLR (APS-C sized sensor), you would be best budgeting for the matching Skywatcher 0.85x focal reducer/flattener. Without it you will get elongated/stretched stars in the corners of your images. You can crop the image to just the flat area in the middle but you'd lose a lot of space. With the reducer you will get a nice flat field and good star shapes across the frame. The other benefit is a wider field of view due to the shorter effective focal length (which is good for larger objects, and for small galaxies you can remove the reducer to increase the scale and crop the bad corners out). The HEQ5 Pro would be ideal for a setup like this - my NEQ6 is a bit of overkill to be honest, but I also have an SCT which I use with it. You also need to think about guiding for long exposures - a guide camera mated to a finder (a finder-guider) is a good place to start, or a cheap ST-80 type scope and guide-cam if you prefer (which I use). See one of my other posts about PHD guiding for the low-down on this whole area. A lot of people use 8" Newtonians for imaging and they work well and don't suffer from chromatic aberration, but they are heavier and require collimation; not difficult but it is another job on top of the many others that come with imaging. The 80ED is much easier as it is ready to use as soon as I get it set up. Aperture isn't really the main issue when it comes to imaging - focal length is what you need to consider first. Long focal lengths will give you a bigger scale (and so are better for small objects like galaxies), but you need more aperture to compensate for spreading the available light out over more camera pixels (or take longer/many more exposures. Shorter focal lengths can get away with less aperture, but of course the scale of the image is much smaller (see my M101 image on here - it's a nice image but notice how small it is compared to images take with long focal length scopes). The key thing is that long focal lengths are much harder to track/guide accurately for long exposures. As a beginner, I would really try to avoid anything with a focal length over about 750mm or you are going to get frustrated very fast, an 80ED with or without a reducer is a good place to learn the ropes in my view. (Of course if you are doing planetary imaging you want a really long focal length, 4 metres or more is beginner stuff, but it's a wholly different set of problems to deep sky imaging). Thank you for coming back to me - seems I need all the help I can get. I was thinking of using a Cannon 1100D - seemed to review better than the 350D and 450D. As for a mount - would the Skywatcher EQ5 PRO Synscan GOTO be a good option - if it has to be the HEQ5 then so be it I want to get this right. As for your pictures - I thought all of them were taken with the 80ED - ie the M42 plus M43 - Unmodded DSLR Image is very large and a great shot. I thought about starting with the 80ED pro + HEQ5 all for just over £1,100 and taking it from there. I am not an expert on the relative merits of the different Canon models, but I know lots of people use the 1100D as it is good value for money. You should definitely for for the HEQ5 for imaging as it has a much more accurate drive (better gears, etc.) People do use EQ5s and smaller for imaging of course, especially if they already own one for visual, but if your're buying specifically for imaging the mount is the one thing you should not cut corners on as it is critical to success. I'm concerned that the 80ed will disappoint visually - but the photos are so so good so I'm not sure what to do. Maybe a good all rounder may be the skywatcher 200p on a heq5 - theres also the c8 newt on the vx mount - any ideas which mount is the best here. So - what do you think of the 200p - would it match your 80ed for photos?